We are proud to support DDOT during Cherry Blossom season with the promotion encouraging visitors to take public transit to the blossoms. This is run in conjunction with the Capital Bike Share “Bike in Bloom” (which we also support). Both campaigns feature electric vehicles this year. The Blossom Bus campaign included the design for the bus and marketing materials, campaign marketing strategy and implementation. The theme developed was “Inspiration Blossoms Here.” Included in the strategy was a community-building school contest encouraging DC students to submit artwork featuring what inspires them in the DC area. The winning artwork was featured in the inside of the bus. 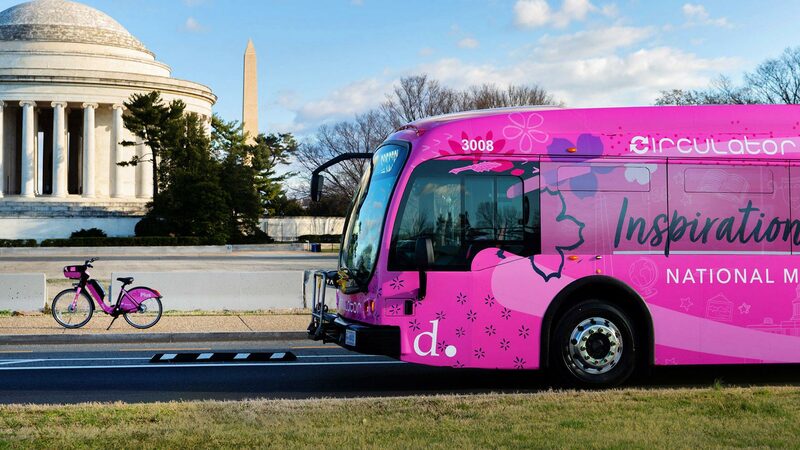 The attention-getting Blossom Bus has resulted in a significant increase in social media activity and visits to the DC Circulator website.